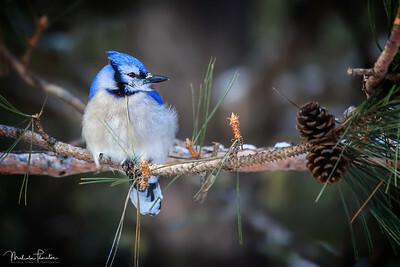 Captured this puffed up Blue Jay perched on a White Pine Tree branch trying to keep warm on this cold winter's day, near Mew Lake in Algonquin Park (Ontario, Canada). The Jay's pose, the pine cones, and the little bit on snow on the tree branch kind of reminds me of a Christmas Post Card. 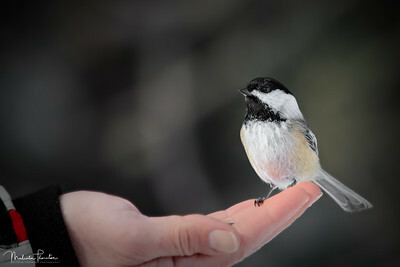 Captured this wonderful little Black-Capped Chickadee feeding from the hand of a visitor to Algonquin Park (Ontario, Canada). I'm awlays amazed how interactive and trusting wildlife can sometimes be in their natual habitat. Blue-footed Boobies do not construct traditional bird nests, instead the lay their eggs on bare ground. 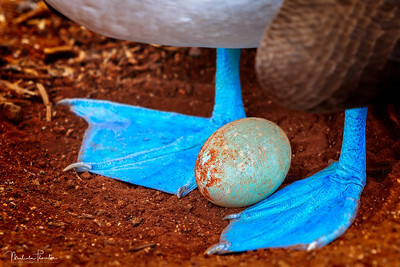 Here, on North Seymour Island in the Galapagos, I was very fortunate to be able capture a close-up image of a mother booby after recently laying her first egg. Unlike most other birds, Blue-footed Boobies do not have a brooding patch (bare skin on their underbelly) to keep their eggs warm. Instead they use their large blue webbed feet to ensure their young are kept well insulated. 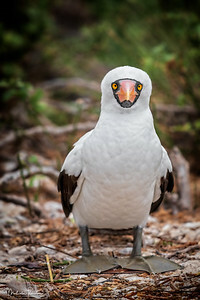 One of the three species of Boobies in the Galapagos, I captured this inquisitive male Nazca Booby looking right at me while on Darwin Beach, Genovesa Island. 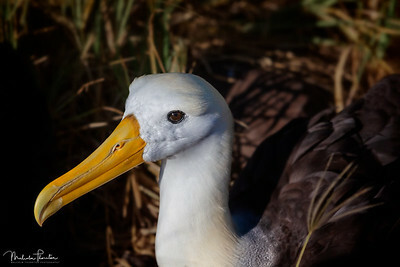 Closeup of the endangered Waved Albatross, taken on the coast of Espanola Island, Galapagos. The Waved Albatross is the largest bird in Galapagos with an average wingspan of over 7 feet in length. 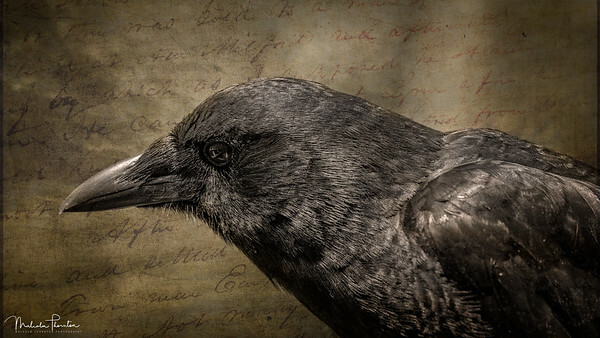 Image inspired by the Poem "The Raven" by Edgar Allan Poe. A Northern Raven set against a backdrop of old parchment and a gloomy sky. 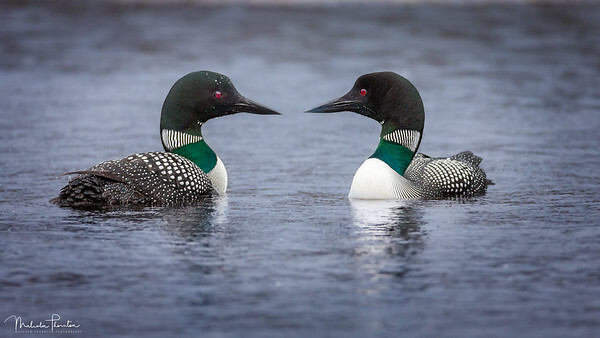 A pair of Common Loons courting on a rainy cold early spring morning on Brewer lake, Algonquin Park, Canada. While sitting on a dock up in the Algonquin Highlands a family of fearless Mallard Ducklings swam right up to me looking for food. 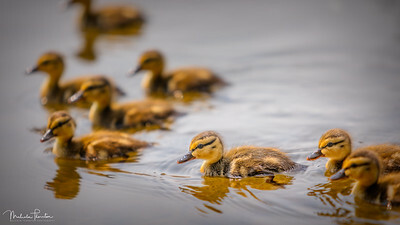 Fortunately I had my camera with me and was able to capture these cute little duckies. Relaxing at our lakeside cottage when this Common Merganser passed by me with her 7 chicks following close behind her. I quickly ran up to the cottage, grabbed my camera, hopped into my kayak and paddled out to take this image of her and her family. 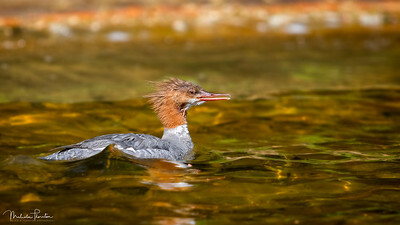 I was sitting by the lake at our cottage and this Female Common Merganser passed by me. I quickly ran up to the cottage, grabbed my camera, hopped into my kayak and paddled out to take this image of her. She was being followed by her 7 chicks, but I captured that in another image. 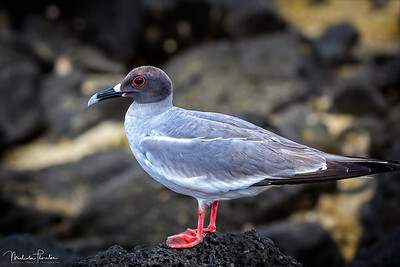 Swallow-Tailed Gull perched on some Lava Rock on the coast of Genovesa Island, Galapagos. The endangered Flightless Cormorant from a reverese angle, displaying it's short, stubby wings. 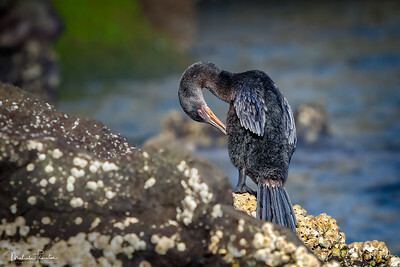 This unique bird is the only cormorant that does not have the ability to fly. Image taken on Isabela Island, Galapagos. 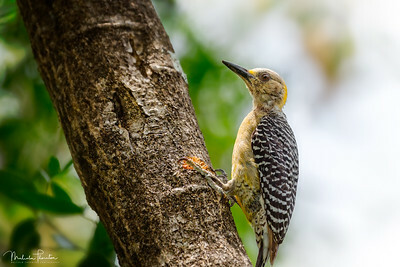 Female Hoffmann's Woodpecker with her beautiful yellow breast and barred back and wings, perched on a small tree in El Jobo, Guanacaste Province, Costa Rica. 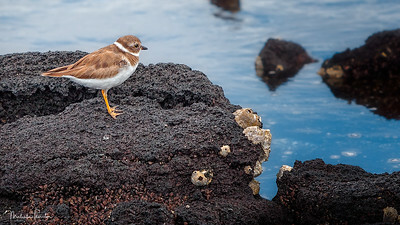 Small Semi-Palmated Plover searching for some crustaceans on some black Lava Rock on the coast of Fernandina Island, Galapagos.